The victorious Matrix Image team. Peterborough & District AA had put a lot of time and effort into making sure the River Nene and Ferry Meadows were ready to hold the Angling Trust Eastern Region Shield match on Sunday. But there is absolutely nothing they could have done to prevent mother nature from ruining the day and reducing the match to a lottery as quality anglers struggled for an odd fish in many of the sections. The river had little, if any colour and the lakes were much the same. The fish are there but just refused to feed. Thankfully it was a team match and the top teams stll showed their class on a very difficult day. Matrix Image topped the field with 65 points but were pressed hard by the Peterborough ‘B’ side on 63 points followed by Sensas Mark One Red on 61. On the individual front Craig Hawksworth of Browning Hotrods took the individual honours with a net of bream taken on the feeder for 12.25kg, then came city rod Carl Singleton, who was in the same section as the winner and put 11.91kg to the scales. The big two-day Float Fish Farm Final was fished on Two Islands and the Wagtail Pool over the weekend and both waters fished well. Anglers had to qualify from 22 matches held over the summer months so the very best lined the banks. Mark Cree staked his claim on peg eight on the Wagtail taking the coveted one point on day one with 131lb 13oz fishing a Method feeder with groundbait and maggot. 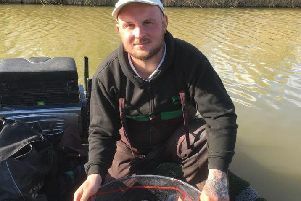 Andy Lawrence collected his one point from Wagtail peg 11 putting 127lb 11oz to the scales fishing a long pole line before moving closer and shorter with meat. Also on one point was Tony Hudson on peg 10 with123lb 13oz and Nigel Baxter on peg 16 with 127lb 14oz. On Two Islands, day one saw Andy Adams on peg one net 128lb 1oz fishing corn over micro and win his section along with Simon Dow on peg eight with 87lb 3oz. On day two the top section of Wagtail saw Dow narrowly win it from peg 20 with 152lb 6oz, giving him the perfect two-point tally which all but guaranteed overall victory. He could only be denied if someone else managed to win their second day section as well. Lawrence did just that which meant it went down to who had the better two-day weight. And that was Dow, who won the £400 first prize with 240lb 3oz. Lawrence claimed the runners-up prize of £300 with 237lb 9oz. Cree finished third and Baxter, who romped home on Two Islands on the second day with 93lb 3oz from peg nine fishing paste and corn over pellet, was fourth. Paul Faulkner once again came out on top when Hotpoint AC fished the Beastie Lake at Decoy on Sunday. He caught 99lb 8oz from peg 18, starting on a small feeder fished just short of half way across and finishing on the pole close in with red maggot over micro pellet. Kev Schneider came second from peg 30 and Ted Rowe on 29 was third.